I hear you often. The ripple of a breeze around my knees. The soft whoosh of the wind blowing through my house. Leaves raining down on me while I walk promenades when it isn’t even autumn. I hear you often. I am sure you do. Because I speak in so many voices. How silly of people to assume one has but a pair of ears and one voice. There are thousands, I say. Millions even. Because when I have to reach out to you, I am heart, I am earth, I am wind, I am fire, I am me, I am you. I am a hundred lovers there were, I am a hundred lovers that will be. So what sense lies in missing you, then? I am enveloped in your presence. It wraps me in a hundred layers that transcend even my body. You go where I go. Where is the pining? Where are the tears? They call longing ‘Radha’. What if it means ‘Krishna’? A synonym, dressed in a different colour? How would they ever know? You are right. They would never know. They can never see the pain that stays hidden beneath my smile. 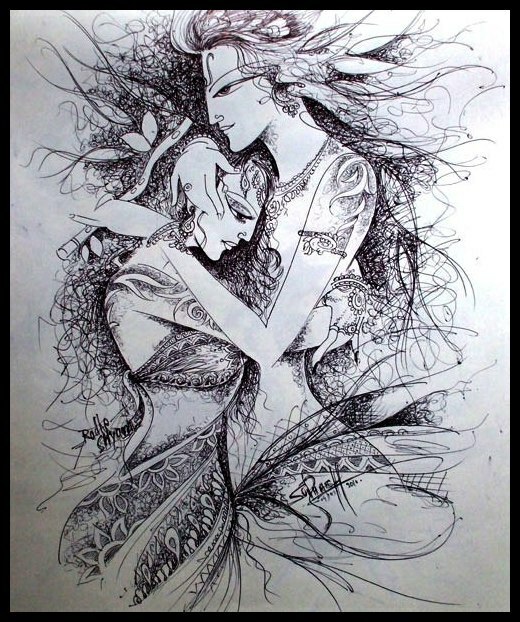 They would never understand that what is Radha, is Krishna and what is Krishna, Radha. They would never fathom the agony of a soul split in two, of the burden of wearing two kayas. That is the pain, dear Radhika. That is the missing. It is that weary feeling of being lost, torn. Then why split in the first place? Why start this leela? Is it not enough to remain one? This entertainment, this evolution, why? You erase my memory with every birth. I have to remember everything, all over again. I have to remember that that dull ache in my bones every night as I lie down to sleep, is the weight of not remembering. Of having to remember, excruciatingly, that every element breathes your name to me. Why start this leela? There is dharma, Madhava-sangini, the need to fulfill duties, to repay the debts of karma, to heal what is broken. But that is a story for another day, priye. Another knife that slices through our union is desire. My desire. The desire to see you searching for me. The pleasure of seeing you find me. The ecstasy of becoming one again. Transcendental as the joy of eternal unity is, desire is undead. It rises, like a ripe seed beneath frosty earth, when spring beckons. And in that little act, you inflict two wounds on me. All at once. You split into two, you and me. And then you go away too, leaving me waiting, turning into ‘Radha’, the ‘Radha’ of longing, of tearing, waiting by the Jamuna. Not the ‘Radha’ that means Krishna. I have turned into every lover’s quoted example. I have become the pain from a phantom wound. I am you and all at once, I am not you. I no longer see my own reflection in the dark waters of the river you have left me by. I see you. Ah, dearest Vrindavana Viharini, how easily you fall prey to my leela. How ready you are to see what I show you. How unquestioningly you believe what you see. But without you and your unconditional acceptance of this plot, my sundari, this play wouldn’t be as beautiful. Whether it is I & you, Shiva & Parvati, or any man & woman, Purush and Prakriti must constantly engage and disengage from passion play. Nothing can break the cyclical nature of existence. We must break and mend, part and unite, cry and laugh for eternity. For how will we belong, without tasting over and over the salt of the other’s tears, and the madhurya ras of the other’s embrace? So there will be no end, you say? No final closure. No final relief. No final oneness. Just this eternal ekta and dvandva, this constant chase must continue. If there is no other way for Prakriti and Purusha to engage and disengage, then what remains of this tarka and vitarka? Nothing. Nil, shunya. There is tremendous rest in this shunya. I am that when I am not with you. I am that when I am with you. And I am that in between too. An entire universe, not of minds floating inside different bodies, but of bodies floating inside a singular mind. You know now, dear Gandharvika, that you and I are one, even when we are not. You know why you hear me often. Why I am like the ripple of a breeze around your knees; like the soft whoosh of wind blowing through your house; like leaves raining down on you when you walk the promenades when it’s not even autumn. You hear me often, you know, because I am the song of your heart.